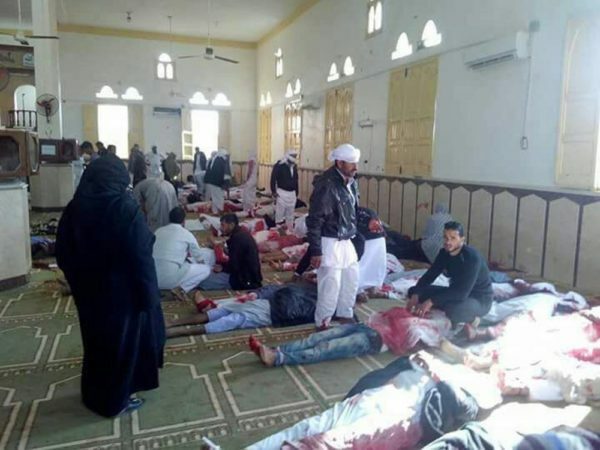 President Muhammadu Buhari has condoled with the people of Egypt over the attacks on a mosque in North Sinai that left many dead after prayers on Friday. According to Guardian, at least 235 people have lost their lives after militants staged an attack. Just at the closing of Friday prayers was when a bomb went off in the mosque. A military source who spoke to Guardian said militants in 4 off-road vehicles then approached and opened fire on worshipers. Witnesses say the gunmen numbered up to 20, and at least 130 people were reported to be injured. Buhari’s condolence message was made in a statement by his Senior Special Assistant on Media and Publicity, Garba Shehu, in Abuja on Friday. The president condemned the dastardly act on innocent worshippers, saying that the incident had further reinforced the position that terrorism had no relationship or respect for any religion, and should be visited with the full wrath of the law. He reiterated that the workable panacea to such mindless and irresponsible attacks on citizens would be “a global joint action that continually shares intelligence, simulates scenarios and regularly updates on both local and international threats’’. President Buhari prayed that the almighty God would receive the souls of the departed and comfort the families of those directly affected. Bestman Games to Unveil its First Proprietary Board Game this November ? NIGERIANS, are being sold as slaves in Libya as we speak! Forget Boko Haram! – not a peep squeek from B#%€ n###! He hasn’t condemned Boko Haram and Fulani herdsmen for killing Nigerians. Why did Nigerians elect this idiot. Nigerians some of you can complain toooo much and that is why you guys are not moving forward. God Almighty hates complaining. May God have mercy on you Nigerians who always condem and conplain about everything. He did well. God bless Nigeria in Christ Jesus Amen. I Love my Country Nigeria, so lets all stop this conplaining here and there. Jesus Is Lord Amen. Continue suffering and ‘schmiling’ you hear? People like you never hold their leaders accountable. Nonsense. WOW, THIS IS LOW…..even for this m###a f#c##!